For those planets with “less than temperate” climates, I’ve often found that my crews because increasingly irritable, lazy, and whine and complain about anything put in front of them to eat. I mean, who doesn’t enjoy flavoured shaved ice in a balmy 73 degrees kelvin? Some people. I’ve always been a sensitive soul, so I listened. Warm, easy, packed full of protein, carbs and healthy fats all in one glorious little package, this winter breakfast is sure to please even the most fussy. If not, the airlock might. Optional: You can garnish the egg with anything healthy you want. Basil is a good place to start. Scoop out a little of the avocado from the center to make a little additional space for the egg. 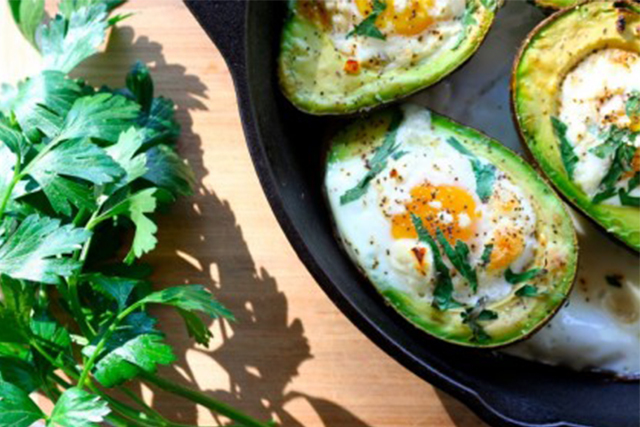 Place avocados in a cast iron skillet. (A baking pan works as well if you don’t have a cast iron skillet). Bake at 425 F for 20 minutes. This results in the eggs being well done, if you like your eggs a little runnier, reduce the time. Top with parsley, cheese, and salt and pepper to taste. This entry was posted in Roc's Recipes and tagged EVE Online, Roc Wieler. Bookmark the permalink. How do you get negative Kelvin temperatures ? You canna change the laws of Physics . . .